Edward Hopper was the star of the American realism movement and famous for his atmospheric landscape and cityscape paintings. Edward Hopper was a complex personality, always battling with his own demons in order to make the most of his undoubted talents. The painter would try different locations for his work as he attempted to freshen up his motivation. 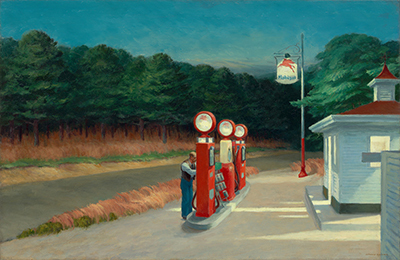 Whilst achieving critical acclaim for much of his career, Hopper began to be superceded by the Abstract Expressionists in the 1940s. The likes of Rothko, Pollock and Willem de Kooning were now the latest craze for art fans. 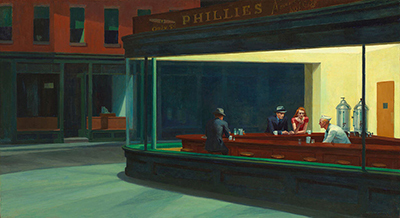 The likes of Nighthawks and Gas indicate how the artist frequently used just a small splattering of individual portraits amongst a carefully orchestrated scene. This was an artist who would use realism art techniques, but adapt what he could see into his own intepreted reality. In a way, it was almost a combination of American Realism with ideas from Impressionism. It is widely accepted that the impressionists who impacted his work the most included Cezanne, Monet, Degas and Pissarro. 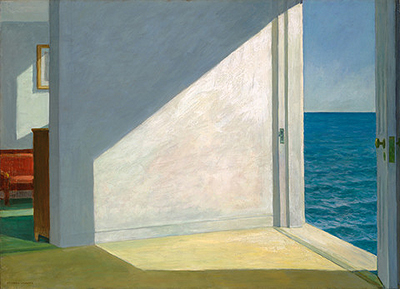 Hopper looked far beyond the French impressionists for inspiration and was a passionate follower of art history, all the way back as far as the Renaissance. Much of his early work used darker shades of the likes of Francisco Goya, Caravaggio, El Greco and Diego Velazquez. It was only later that brighter impressionist colours began to take over. 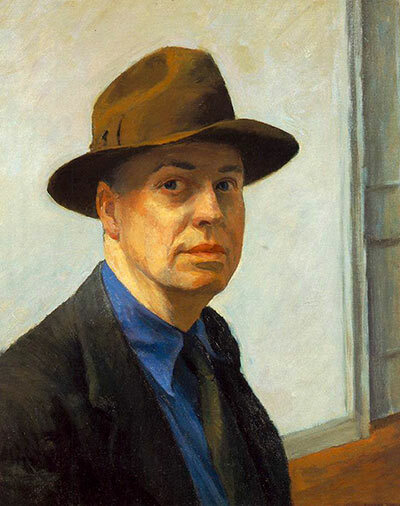 The Abstract Expressionists would not distract Hopper from his chosen path, and his paintings continued along his themes of ciy life which seem to have connected well with the public for many decades since. 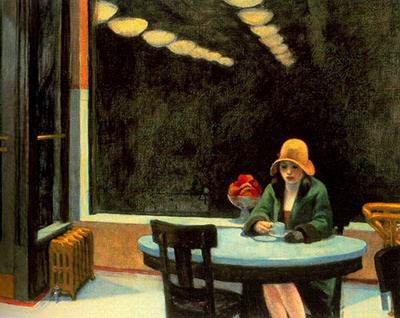 Edward Hopper paintings cover the American realism movement and Hopper is amongst the most popular artists from the whole of the 20th century. 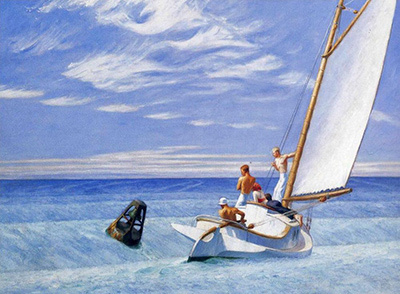 This website covers the best paintings from Edward Hopper and also covers his life and career in detail. There are photos of his work and also a fuller list further down the page of his back catalogue. 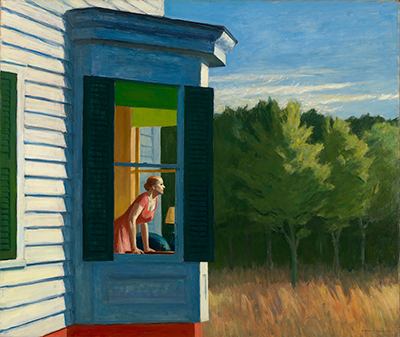 Edward Hopper was most famous for reflecting American life in a calming, stylish way which many find instantly charming and has helped his reputation to remain exceptionally strong up to the present day. Hopper's original paintings are amongst the most reproduced of any American artist currently, most frequently as framed giclee art prints, posters and stretched canvases with customers choosing from a huge selection going back the artist's whole career. Edward Hopper paintings typically cover American landscapes with a realist style that whilst accurate is also quite contemporary because of the colours that the artist used as well as the scenes that he would choose to cover. In some cases there would be humans set within the scene as the main focal point, whilst in others it would be a true landscape piece within nothing to appreciate but the sprawling countryside or seascape. 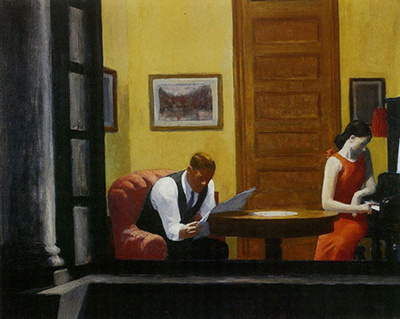 Whilst part of the realist art movement, Edward Hopper always used a slight lack of detail or precision on his characters that adorned several of his paintings and this helped to create an atmosphere which felt relaxing and accessible. 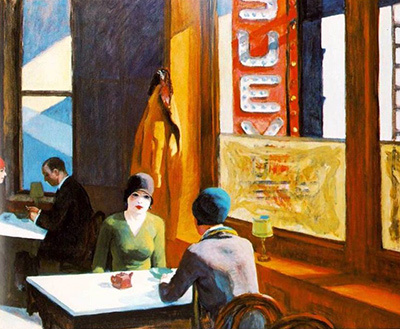 His paintings consistently had very simple scenes which concentrated entirely on the mood of an individual at that time, as seen in Nighthawks, Sunday and Hotel by a Railroad. The slightly blurred humans tend to draw the viewer in, curiously looking for more information on each scene.